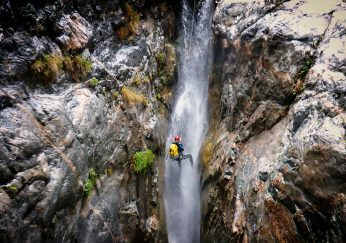 Professional Photographer, Rui Telmo Romão, is a traveller, adventure photographer and a canyoning expert currently living in Lisbon, Portugal. 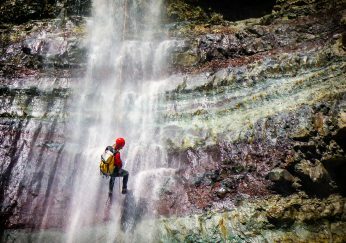 Rui enjoy’s spending time in the mountains and in the wilderness collecting images and stories. His works have been published in Matador Network, Diário Digital and Revista Outdoor and have a Master in Cinematography from ESCAC (Catalan Film School). 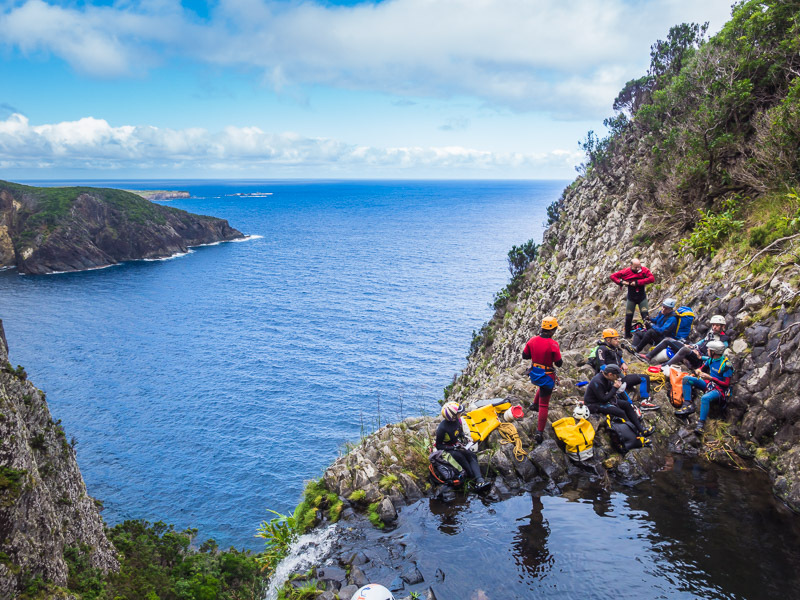 In October 2014 he was fortunate to attend to the first Canyoning International Meeting Azores in Flores Island that gathered 120 participants including Spanish canyoneers. 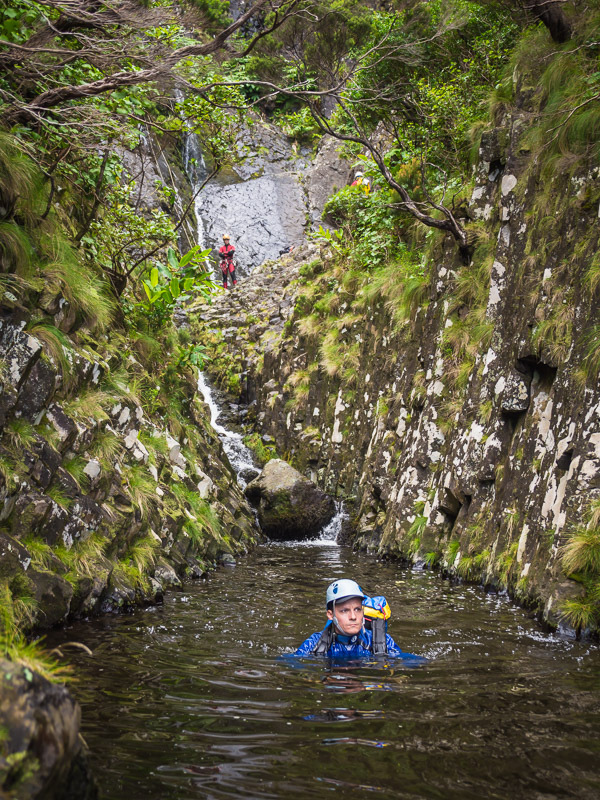 Although the island offers unique canyons and has a massive potential for the sport development it is still unknown to the majority of the adventure community. 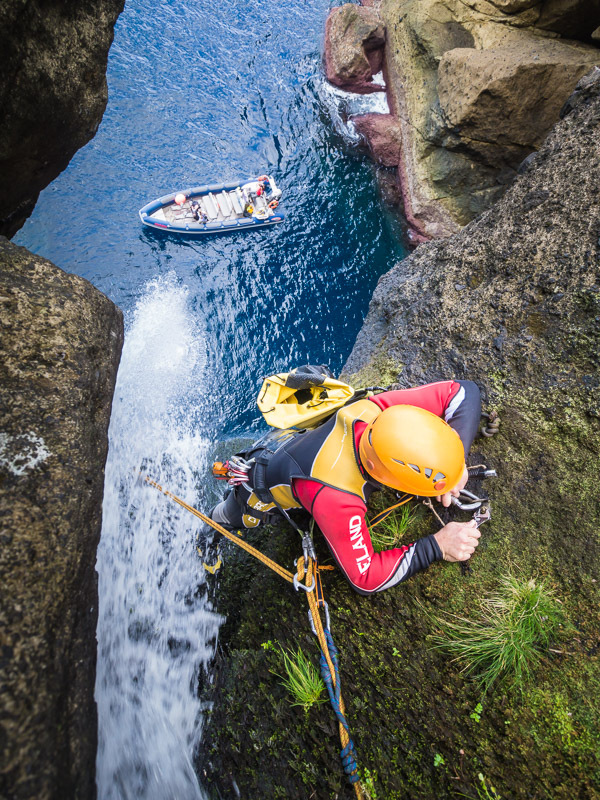 We are extremely grateful to Rui for providing these wonderful shots of canyoning in Azores. 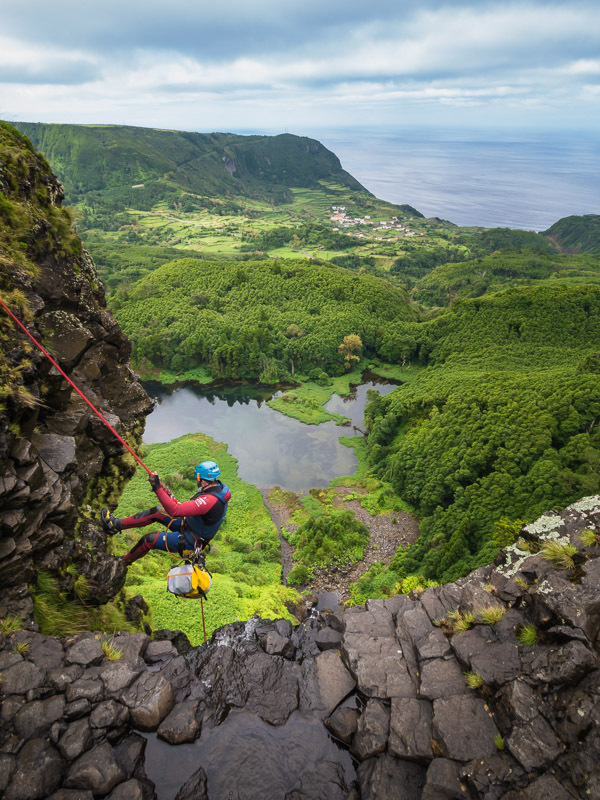 And hopefully one day we’ll be able to get over their and experience the canyons of Azores. 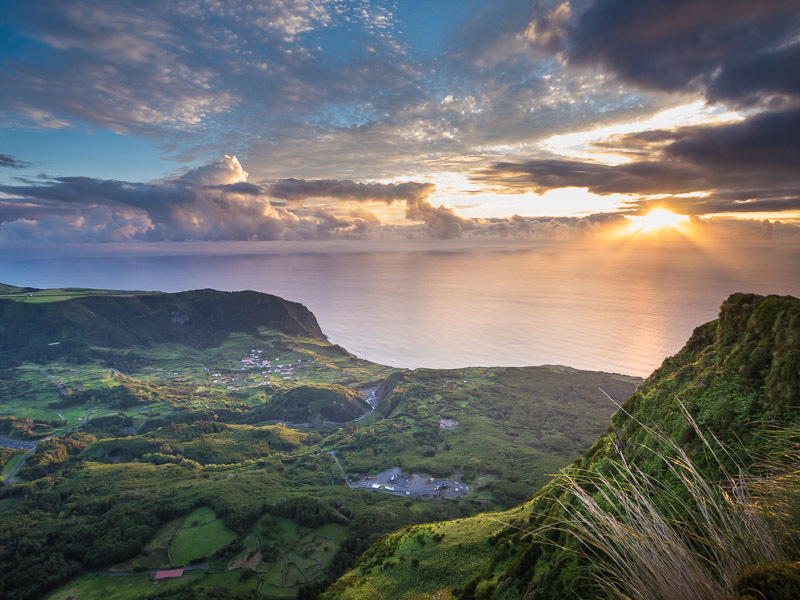 Visit Rui’s portfolio and photo blog website for some more amazing images. 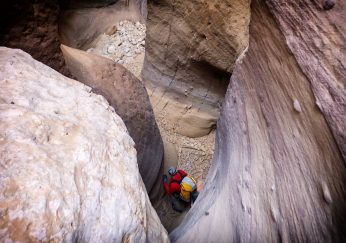 Our group enters Rib. Alquevins, a 4 hour descent ending at the sea, with Corvo Island solidly present on the horizon. On the first day of the meeting I joined a team from the organization. 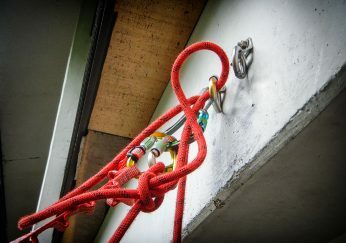 They were given the task to checks if the anchor points were in good conditions and replace them whenever needed in Rib. das Barrosas. 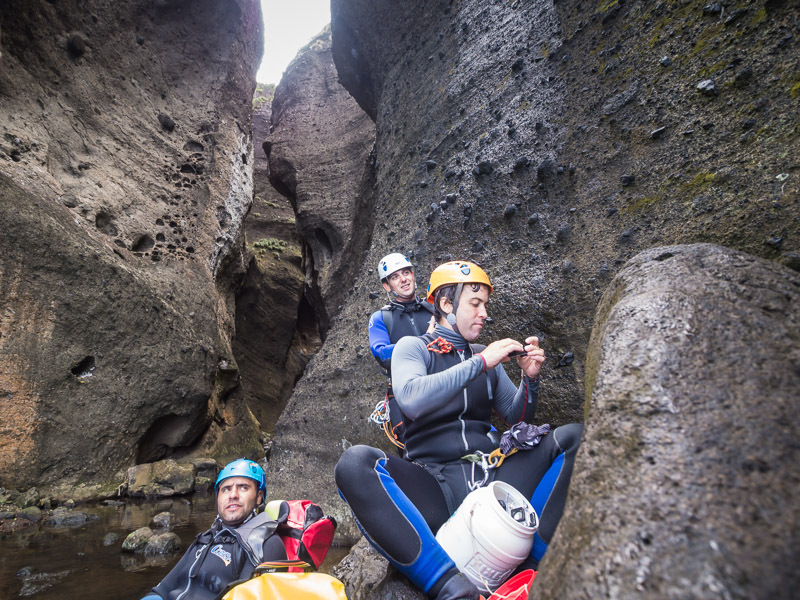 Ribeira do Ferreiro is a short but highly technical route. 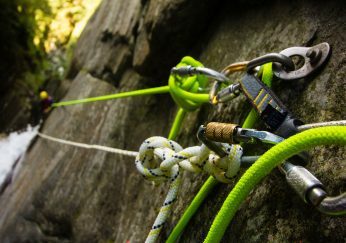 With less then 1 km in length it presents a 240 meters series of 9 proceeding rappels. 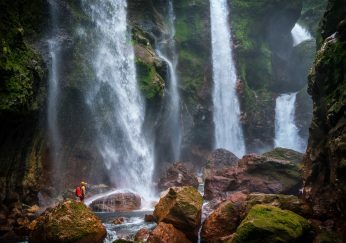 At the top of this 120 meters waterfall it is possible to contemplate Lagoa das Patas the lagoon at the bottom and Fajãzinha the small town near the coast line. 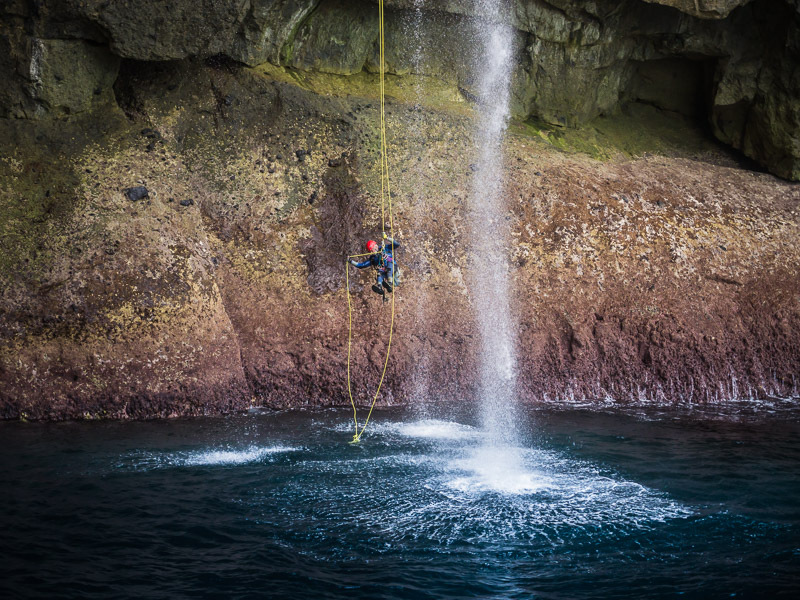 While Rui Borges was replacing an anchor point the rest of the team took some time of to enjoy a small snack and take some photos. (Rib. das Barrosas). 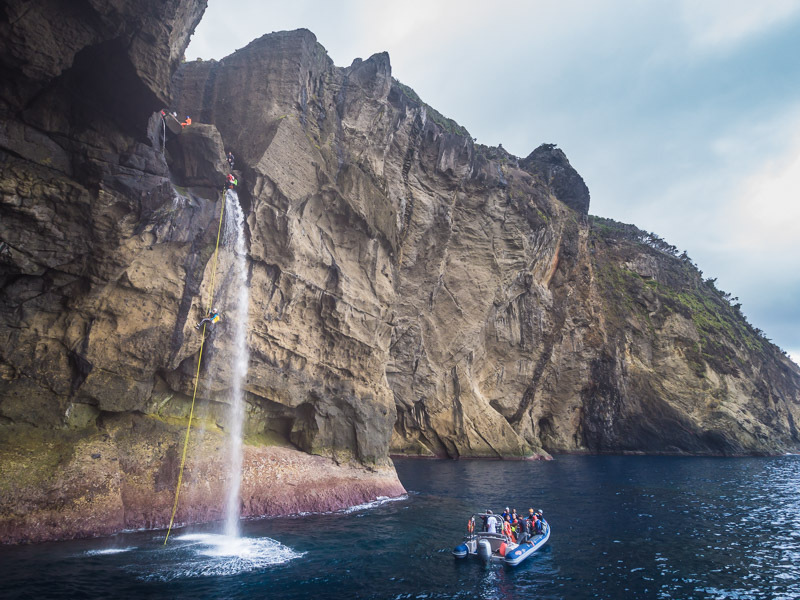 The 20 meter overhanging waterfall to the ocean is the last vertical from Ribeira das Barrosas. 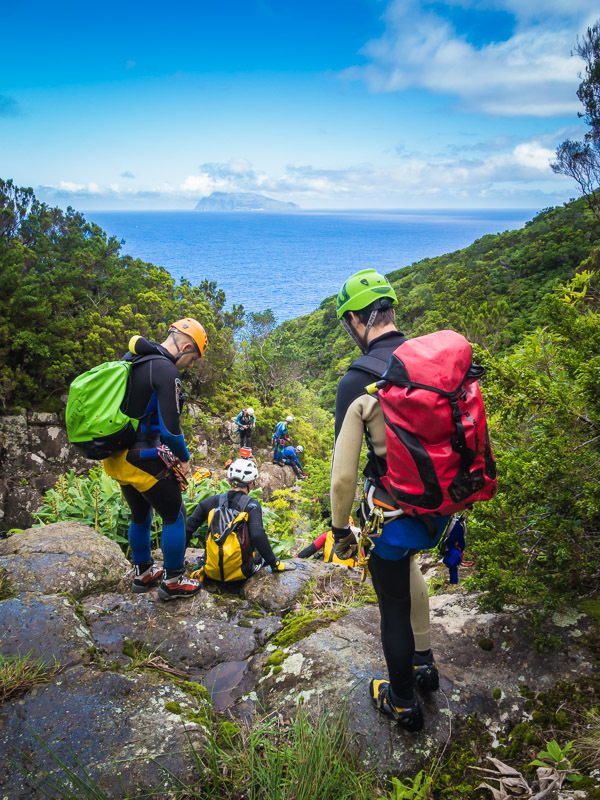 This unique scenario makes this route one of the most appreciated in the island. 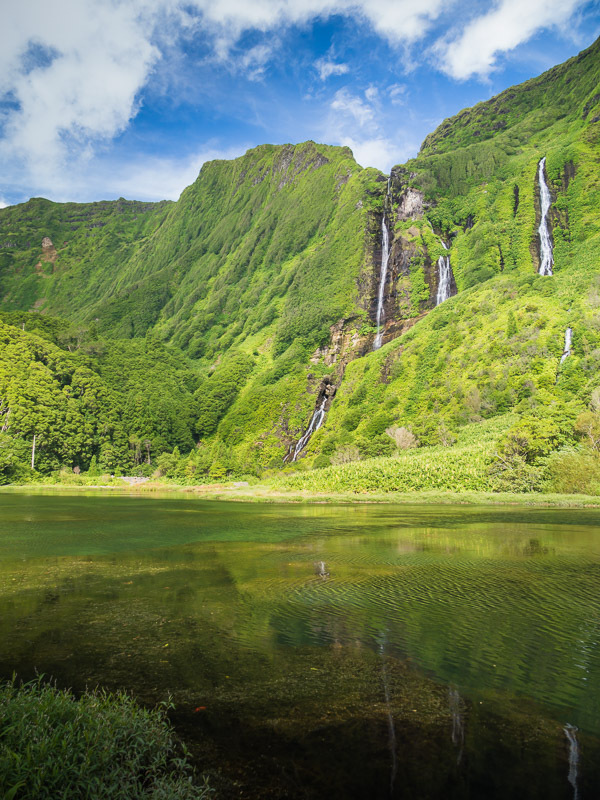 Ribeira Funda da Ponta Ruiva is deep and green. 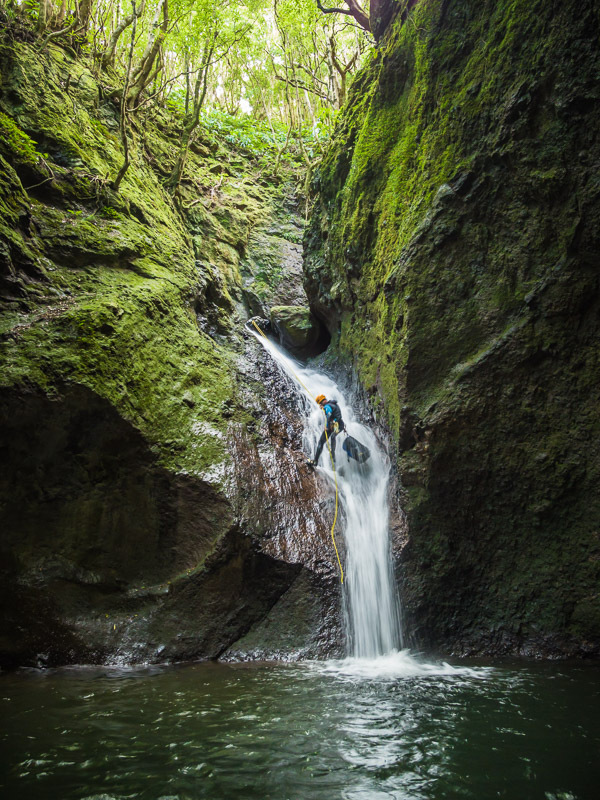 The canyoning offers a 3 hour descent with medium and small waterfalls, with ocasional jumps and slides. Rib. 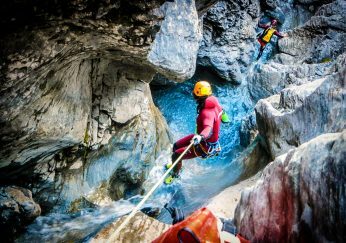 das Casas is another favourite canyoning route by the meeting participants. 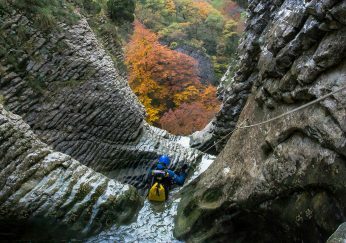 The ending is a waterfall higher than 100 meters. 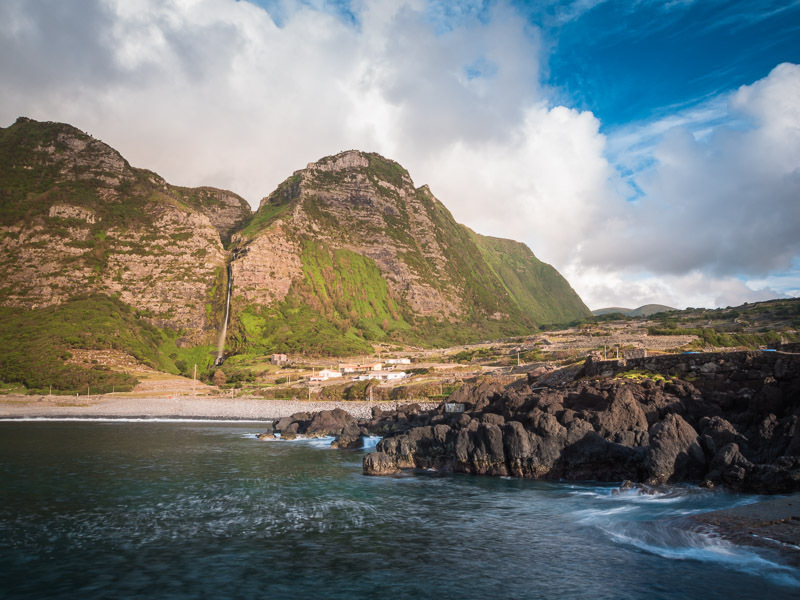 Close to Fajã Grande it is possible to relaxe on a cafe balcony near the ocean after a full day of adventure. The sun sets over Fajãsinha. 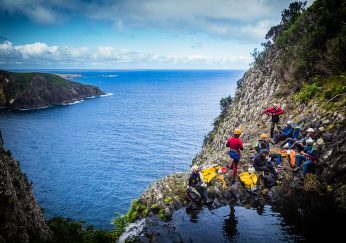 With a sharper and higher coast line the western side of the island presents dramatic and beautiful landscapes filled with high waterfalls and half a dozen canyoning routes to be explored.